When I was in my early twenties living in Delaware, my friends and I would head to the beach during the day and the bar at night to dance the night away. We'd order a Pink Lemonade if we wanted something that wasn't too strong and an Orange Crush when we had a DD. Side note: an Orange Crush is legit - just sayin'. If you're ever at the beaches in Delaware, be sure to stop by any of the bars or restaurants to get one. I believe the original concoction was developed at The Lighthouse Dewey Beach, but it was soo good that all the other places caught on. Anyway, now-a-days, I don't necessarily have a cocktail of choice - I switch it up depending on where I'm at, who I'm with and what I'm in the mood for. But simply put, now that I'm in my 30s, my "go-to" drink is: mimosas in the summer and red wine in the winter months. I most definitely prefer red wine though -- pinot noir to be exact. In 2011, my wine palate broadened when I met Tawnya and Vegas Wine Club commenced. While our husbands worked odd hours, we held a monthly Wine Club so we didn't have to cook and eat alone. 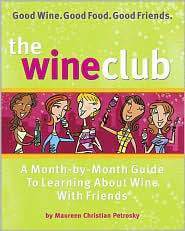 Each month, we followed The Wine Club book. I've been living in a communal residence that doesn't allow adult beverages. None, zip, zilch. And no, for those of you who don't know me, I'm NOT in rehab. :) My husband and I are temporarily living in our own room in a huge ADA accessible house until he is medically boarded out of the military. After five months of living here, my friend Carlie traveled by air and Tawnya drove 4+ hours to visit. Carlie brought her four month old son and husband in tow and Tawnya brought her husband and several bottles of wine. The morning after they arrived, I woke up with a smile on my face; not because it was Valentine's Day or that I had several glasses of wine the night before, but because two of my awesome girlfriends traveled great distances just to visit me (oh and my husband too).